Huntington Ingalls Industries (HII) announced on August 03, 2018, that its Ingalls Shipbuilding division has received a $165.5 million, cost-plus-fixed-fee advance procurement contract from the U.S. Navy to provide long-lead-time material and advance construction activities for LPD-30, the first Flight II LPD. «This is a significant milestone as we embark toward a new flight of LPDs», said Ingalls Shipbuilding President Brian Cuccias. «The Flight II LPDs will be highly capable ships meeting the requirements and needs of our Navy-Marine Corps team. We look forward to delivering this series of affordable LPDs to our nation’s fleet of amphibious ships». The funds from this contract will be used to purchase long-lead-time material and major equipment, including main engines, diesel generators, deck equipment, shafting, propellers, valves and other systems. Ingalls has a vendor base of 400 companies in 30 states that will be involved in the LPD Flight II program. Ingalls has delivered 11 San Antonio-class (LPD-17) ships to the U.S. Navy and has two more ships under construction. The keel for USS Fort Lauderdale (LPD-28) was laid last October, and fabrication has begun on the 13th ship in the class, USS Richard M. McCool Jr. (LPD-29). 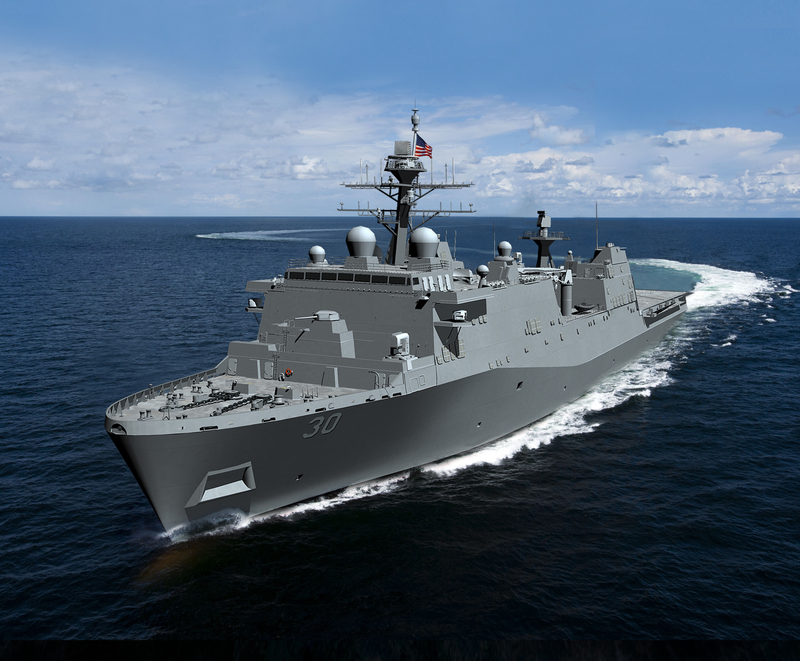 Start of fabrication on LPD-30 is scheduled for 2020. The U.S. Navy’s requirement to replace the retiring LSD-41/49 class of amphibious ships will be met by developing and acquiring the second flight of the current LPD-17 class, beginning with LPD-30. The additional capabilities of LPD Flight II will support new and emerging U.S. Marine Corps and Navy requirements such as the Ship-to-Shore Connector, CH-53K Stallion helicopter and improved troop armory/weapons stowage. The San Antonio class is a major part of the Navy’s 21st century amphibious assault force. The 684-foot/208-meter-long, 105-foot/32-meter-wide ships are used to embark and land Marines, their equipment and supplies ashore via air cushion or conventional landing craft and amphibious assault vehicles, augmented by helicopters or vertical takeoff and landing aircraft such as the MV-22 Osprey.